Ranjan K Baruah, career mentor summarizes, "We are aware of insurance or investing money for the future. We are also aware of different corporations or companies offering different insurance for individuals." A word associated with investment is actuary and there is a term called actuarial science. Actuarial Science is the discipline that applies mathematical and statistical methods to assess risks in insurance and finance industries. Dictionary meaning of actuary is a person who compiles and analyses statistics and uses them to calculate insurance risks and premiums. It means a person skilled in determining the present effects of future contingent events or in finance modelling and risk analysis in different areas of insurance, or calculating the value of life interests and insurance risks, or designing and pricing of policies, working out the benefits recommending rates relating to insurance business, annuities, insurance and pension rates on the basis of empirically based tables and includes a statistician engaged in such technology, taxation, employees’ benefits and such other risk management and investments. Actuaries are experts in assessing the financial impact of tomorrow’s uncertain events. A student after passing senior secondary, graduate, post graduate, Engineer, MBA, CA, ICWA, etc with sound knowledge in Mathematics & Statistics may appear for the exam conducted by Institute of Actuaries of India. Apart from academic qualification aspirant must love logic and problem solving; good communication skill and excellent business awareness. 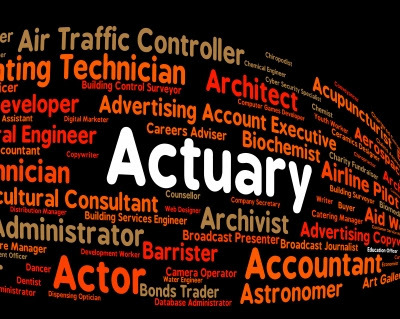 Institute of Actuaries of India is a statutory body established under The Actuaries Act 2006 (35 of 2006) for regulation of profession of Actuaries in India.